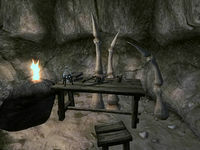 Howling Cave is a medium-sized cave east of Skingrad containing necromancers (quest-related). It contains two zones: Howling Cave and Howling Cave Lower Galleries. Meridia: Wipe out a band of necromancers. This cave can be entered, fully explored and all items retrieved without starting the related quest. If you do enter this dungeon beforehand, once you have killed all of the necromancers you will get a quest update. It is recommended that you enter this dungeon during the related quest, though, since the enemies will be tough for lower-level characters and the quest-markers point to each necromancer making taking them out significantly easier. Because the five necromancers here are spawned at the start of the game, a leveling quirk causes them to have unusually large numbers of potions, especially at higher levels. This cave contains 1 Cairn Bolete plant and 19 Wisp Stalk plants. 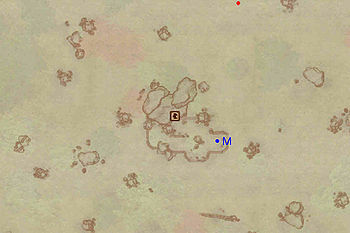 This location's map marker (M on map) is named Howling Cave (editor name HowlingCaveMapMarker). The entrance door is WNW of the marker, 60 feet away. The entrance to this cave is located in a small graveyard with several tombstones and an open coffin with a Zombie corpse which suggests the presence of necromancer inhabitants. This zone is pretty straightforward: the only side passages you find contain nothing more than some easily disposable nuisance animals. Two silver veins can be found in this zone: one in the small room from where the side passages start and one in the right passage that departs from the same room. Finally, approach the rock wall at F which will lower and reveal door C, leading to Howling Cave Lower Galleries. Unlike the first zone this one is quite challenging. While fighting in one part of the zone it is possible for other enemies to become alerted to your presence and you will find yourself battling against two or more enemies. 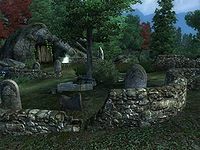 This zone is also full of zombie corpses, testimonies to the necromancers' evil deeds. You enter from door C and find yourself in a short corridor with a Swinging Mace trap (F) triggered by the pressure plate at E. In the first room are two Necromancers (Q) alongside an undead. This part can be quite tricky as you might end up fighting up to five enemies at the same time. This room also contains two hanging zombie corpses and a good share of non-random loot, especially on the table at D. From here two corridors depart: take the left one, which leads you to a small room with another Necromancer (Q) and an undead. This room also contains a Zombie corpse on a stone altar and a few books. 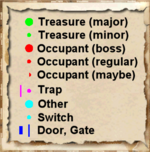 If you take the southern corridor you will end up at yet another intersection: straight ahead is a small room with a necromancer (Q), an undead and the boss-level coffin (B). If you attack this necromancer you will probably attract the last necromancer and 1-2 undead as well. Try to fight them at the intersection of the two corridors and to not get trapped in the small room. This room also contains an interesting feature in two zombie corpses which have been clamped to the ceiling. The last necromancer (Q) is in the southwest corner with 1-2 undead. This room also contains yet another two hanging zombie corpses and a skeleton one killed by a scythe.